Date and time: Wednesday 20 January, 2010. 12:14pm. “Gently winding its way through Melbourne’s north-western suburbs, the Maribyrnong River is a destination for suburbanites to enjoy leisure activities. People come here to fish, kayak and row, as well as walk and jog along the banks of the river. Today my walk was made more enjoyable by being in the company of a mate. I took the camera along and had a great time photographing the comings and goings. 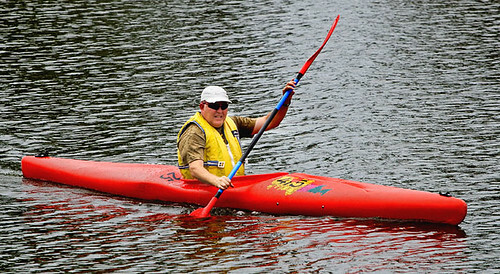 Whilst sitting and having a chat, this bloke paddled right up in front us. He was having fun, and so were we.” – Darren Stones.